Most of the time in life you won’t get something unless you ask. I’ve been amazed at the discounts, and even free things I’ve gotten just because I decided to pose the question. It doesn’t always work. But it is almost always worth a shot. However, actually asking for a discount isn’t ridiculous. You just have to know when and how to ask. I’ll give you a few examples of how asking for a discount has worked out for me and then we’ll extrapolate some themes from there. Remember when I fixed my hot water heater? Unfortunately it wasn’t a permanent fix and the old bugger kicked the bucket anyway. I decided to get one of the super efficient electric hot water heaters (and it’s awesome) – but that’s another story for another day. I found the plumber/electrician I wanted to install it. He had more experience with these water heaters than anyone else in town. His quote wasn’t out of line but I asked him if there were any discounts available. He took $200 off the price he had quoted me. All it took was asking. If you’ve never attempted to lower your monthly cable or internet bill you’re throwing away money. Just asking for a discount can save you big money. Just make sure you ask for the customer retention department. This is crucial because the first person that answers the phone doesn’t have much power to help you. I’m actually still with one of the giant cell phone companies that still does the contract thing. I love the small players like Republic Wireless but at this point in time there are a lot of reasons for me to stay on my family plan (again, another post for another day). Besides contracts, another one of the outrageous fees they abuse us with are activation fees. A simple phone call to your provider can put $36 back in your pocket. Sometimes you get rejected and have to call back and speak with someone else. I’ve always gotten at least half of it refunded. Honestly, we really shouldn’t be banking with institutions that charge us fees when lovely online banks and credit unions exist. However, a plethora of Americans still choose to stick with the big banks for “reasons of convenience.” If you finally get tired of seeing that $5-10 going straight to them consider asking for a discount! I helped my parents with this a few years back. Even the giant banks will move you into a different account or tell you how you can avoid those crappy fees. Just ask! This one is kind of ridiculous. But yes, when I get a pizza at Pizza Hut, I ask if they have any breadsticks laying around that they would part with. Half of the time they give me a glorious bag of the carb-laden glory that is their breadsticks – for free. NEVER pay full asking price on Craigslist. My buddy Andy was in the market for a Prius last year and found one he liked on good ol’ Craigslist for $12k. Andy’s a nice guy. He liked the car. But he really didn’t want to spend more than $10k. So he just asked if they would part with it for that amount. And he got a sweet ride for ten thousand bucks. He’s sure glad he asked! My wife and I really wanted a nice couch for our home when we got married. We were looking all over the place for something nice but also in our budget. Craigslist was an obvious place to turn but we found something that we loved at Crate & Barrel. The couch was originally $4k. Craaaaazy expensive. It had been marked all the way down to $1400. But we had a strict budget. So I called the store and asked if they would take $1k for it. They said yes. All because I asked. I was shopping for a bike pump just a few days ago. I did the usual google search for a promo code. I didn’t find anything though so I sent a nice email asking if they had one that I could use before checking out. They quickly emailed me back with a promo code for a few bucks off! So here are just a few examples of asking for a discount and how effective it can be. Maybe it saves you $20 a month on your internet service or it could save you a huge chunk on a used car purchase. 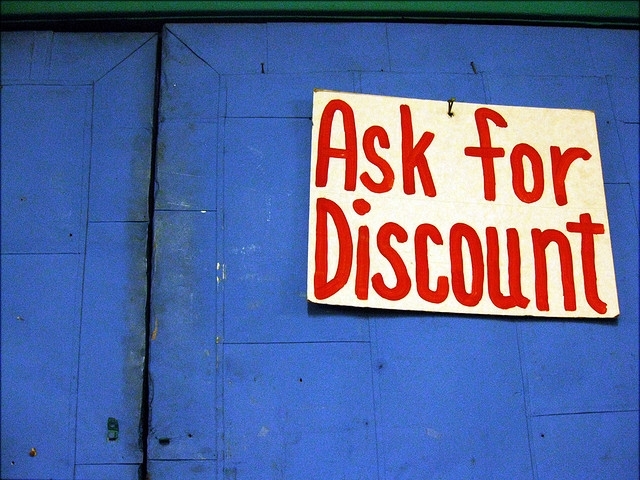 Here are a few thoughts on how to approach this art of asking for a discount. Use technology. It works. For some reason company customer service seems to be at its absolute finest on Twitter. Consider tweeting at a company you love for a discount. Be nice. No-one wants to give a jerk something for free. Asking nicely is key to making this discount a reality. Don’t be scared of rejection. The art of asking for a discount involves being brave. What have you got to lose? Be willing to walk away. Look at all the scenarios I just wrote about. I could easily walk away from all of those companies (even the cell phone company thanks to T Mobile) and still feel ok. No breadsticks? I’ll be alright. No discount on the water heater? I can look up other water heater installers. No couch discount? I’ll keep looking! If you don’t ask you can’t get. The art of asking for a discount certainly isn’t the easiest thing to explain. But if you follow those basic tenets you should find yourself landing some discounts that you might not otherwise have received. What discounts have you gotten just because you asked? 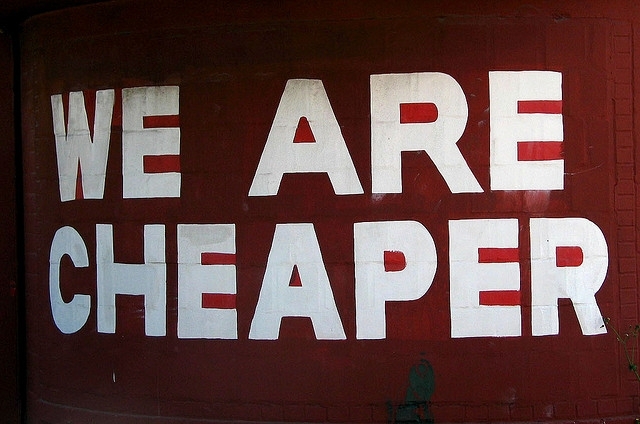 Does asking for a discount make you nervous or uncomfortable? Yep, this works for me ALL the time! A few weeks ago, noticed I wasn’t getting the Internet speed I was supposed to. Cable company talked me into upgrading to a newer modem. I asked if they’d waive the monthly rental fee since I was a “good guy” and a long-time customer. They kicked me over to the promotions department and I got an $8/mo discount, all I had to do was ask. Several months ago I noticed that a retail box store was offering a VOIP phone service for $9.99/mo. I called my current provider and asked them if they could match that. No problem! Cut my phone bill in half. Nice! I love hearing other stories of how asking for the discount works. Good job dude! Follow-up, the other day I had a domain name come up for renewal. Instead of blindly clicking through my renewal at $16.50/year, I called up the sales department. For being a long-time customer, they offered me one-year for $12/year, or $10.50/year if I renewed for five years. Saved me $30. Exactly! What’s the best discount you’ve received because of it? A few weeks ago I made a purchase online at bloomingdales.com (free shipping on everything if you join their free Loyalty club). The item I bought was on sale, sale ending the next day, so I clicked the button. 2 days later, I got an email from them, with a code for 20% off any purchase – dang! I went onto their site, found a form to email them, and asked if there was any way they could honor the discount code for my recent purchase? The next day I got a response back that the discount code could not be applied since the code was not valid on the day I made the purchase – but never fear, they had applied a 20% discount to my purchase and I would see a refund on my card, and have a great day! I love it Spiffi! Way to ask! Great article. Another good one to ask for a discount is cable/ satellite television. Actually that might be more of a threat than a request as I find you have to threaten to fire them before they give you their best price. Thanks dude. Yep – cable and satellite are ripe for the picking on discount asking. And sometimes a threat might be more effective with them for sure. I always ask at the jewellery store. EVERYTIME they punch things into their computer and come up with a way cheaper price. Rarely on the really cheap sale items or catalogue items, but sometimes on just regular sale items and ALWAYS on full price items. Saves bucketloads.